The time has come. You’ve been working in the same full-time IT role for several years and you’re looking for a change. Or, maybe your company is downsizing and you want to be proactive in landing a new role. Either way, you’re seeking a new, challenging position that will get you working on some cool projects with cutting-edge technologies. And that’s when you see it – that incredible position that you covet. BUT, it’s a consulting job. What should you do? Do you ignore it and look for another full-time role? Or, do you seriously consider it? Benefits and Financial Considerations. When you’re a full-time employee with a salary and a full complement of benefits, it can seem daunting to consider a consulting role that offers an hourly rate and the potential need to source your own benefits. However, you have to approach it as a financial equation and assign specific dollar values to each part. What will it cost for health and dental benefits? And how will you handle time off and sick days? How many hours do you typically work in the course of a year and how many would you be working in a consulting position? Generally, you want to establish a financial baseline that makes sense. From there, you can work with your recruiter to understand how this expectation aligns with the market. Depending upon your skillset, you may be able to do better than this figure so it’s worth exploring the possibilities. Evaluate risk and reward. If you are seeking a role on a high profile project that will enable you to utilize bleeding edge technologies, you may find amazing opportunities that are also quite lucrative. But you should also understand that the project could get cancelled at any time; for some, this advanced career opportunity might be well worth the risk but, for others, the risk might be too great. In many cases, clients are looking for candidates with particular skills and experience so they are often willing pay a premium for these skillsets. Additionally, the ability to hire consultants typically enables companies to dip into different budgets than when hiring full time employees, offering additional flexibility for clients and consultants. Be realistic. As a tech recruiter who has been advising IT consultants for years, I have had the good fortune to work with and place many extremely talented individuals. But regardless of their depth of experience, I am always honest and seek to educate candidates on the realities of the current marketplace and what specific skillsets will bring to bear. For some, this can be a tough pill to swallow but it’s better to be honest with yourself right from the start of your job search. Timing is everything. This statement is true in many ways. Consulting projects will vary by duration; while some might be 3-4 months, others are 6-12 months and may even get extended from there. Companies are often willing to pay a premium for shorter durations but with longer contracts, that is not necessarily the case – another risk/reward equation. Contract employment is temporary. Some people love the fact that they are brought in to work on a specific project/role and then it’s time to move on. They do the job and then go home, not worrying about the office politics or the “watercooler chatter.” But some people struggle with this situation and prefer to be a part of an organization – part of the decision-making process and company culture. The way that companies include consultants – or don’t – as part of the company culture is highly dependent upon the individual organization. In some places, consultants are considered part of the team and participate in company functions, meetings, etc. But for others, this is not the case. So this is all part of the mentality and personal preferences that you bring to the table. And while you may settle into a project for the next few months, you should never stop networking. Whether the project comes to a close or ends early, you always need to be thinking about what’s next. Is your resume up to date? Are you attending networking events? If you are looking to minimize the time that you aren’t working between projects, then this needs to be part of the equation. The final decision lies with you. At the end of the day, consulting can offer immense rewards to those who are seeking a fast paced career path, along with great earning potential but it’s not for everyone and must be a fit with your personal and professional goals. And once you commit to a project, you must see it all the way through or else you could end up building a negative reputation for yourself in the tech world. It’s critical to be flexible as the market changes. With some contracts, you might make a little more whereas others may pay a little less per hour. Good consultants understand the ups and downs and roll with it to continue working. And good recruiters will be honest about the pros and cons so be sure you have a strong advisor on your side. 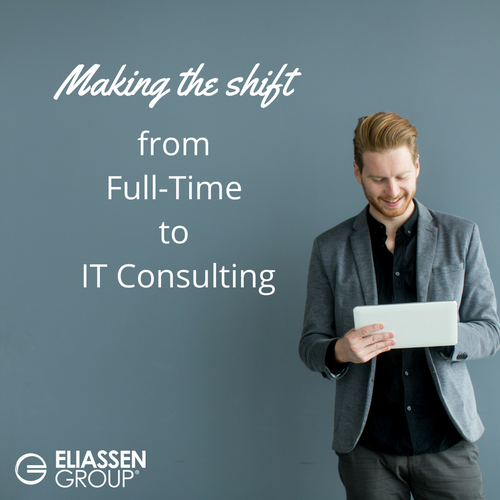 Do you have questions about making the switch from a full-time role to consulting? If so, we’d be happy to chat with you about them. Reach out to us at: solutions@eliassen.com.